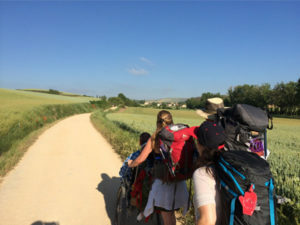 Continuing their inspirational Camino, this week Justin and Patrick share with us their astonishment at the kindness and support from people on the way, making the Camino de Santiago a truly unique experience. We have been traveling on the Camino for the past two weeks and we are now getting settled into a familiar routine. Our days consist of waking up fairly early in the morning (not as early as others) and getting the day started with a coffee and some protein of some sort so Patrick can get enough energy for the day. As we continue our path towards Santiago, we are starting to meet and see some familiar faces along the way. They range from all sorts of places throughout the world like Germany, Austria, Norway, France, Italy, and of course Spain. But the most common thing that we have been really astounded by is the fact that people are so willing to help us along our journey. They help pull, help push, and cheer us on at every turn. It is truly an amazing thing to witness from the seat that I am in. But what really amazes me is how people are so willing to be a part of our journey and let us be a part of theirs as well! We have had friends come over to help us get over mountains and we’ve met strangers who have helped us get up hills and over sticky situations, as well as feed me random ice cream cones. Slowly but surely we are moving closer to our destination and we look forward to seeing those whom we have yet to meet, as well as the friends that we have had to say goodbye to already. The journey of this Camino that we are on is kind of like life at its greatest. There are people who come into your life when you are in need of a helping hand and there are others who step into your life and walk with you. Both have been in abundance and have come along as if their timing was orchestrated. It’s really amazing how when you let someone into your life, even if only for a brief moment, truly beautiful things can happen! Patrick and I are grateful for the new friendships we have developed in this melting pot called the Camino. We are blessed with those who help “Push” us in so many ways and we hope that we push them as well. I was so moved by your words today, Patrick. What a gift to have time to reflect. We so seldom take the time to remove ourselves from life’s busyness and do that soul searching. No wonder God tells us to “be still and know…” We loved the pictures. My, what a beautiful place. Love you more than we can say.